Looking for landscaping books? Biblio.com.au hosts hundreds of of the finest online book stores and booksellers, including specialists in landscaping. Use the list below to locate a specific specialist bookseller or book store near you. Or, use the form below to search the inventory of all booksellers who specialize in landscaping. We buy and sell rare and out-of-print books related to Travel & Exploration, Gardening and Natural History. 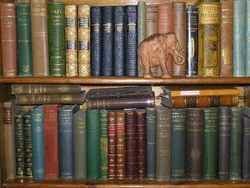 We are always interested in purchasing libraries, collections and individual books of merit in our specialties. We have been selling books on the Internet since 1993. We also sell antique prints - please email us for our current web page with images of each print and map. BROWSE OUR BOOKS FROM THE LISTS DIRECTLY BELOW, or search by author, title, keyword.